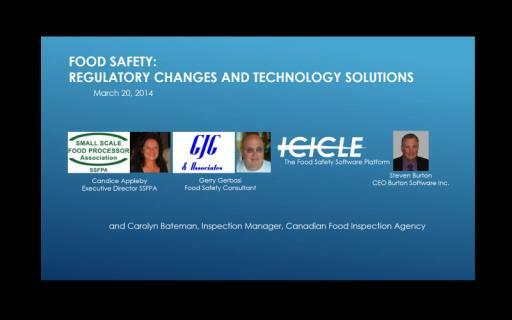 Listen to Candice Appleby, Executive Director of the SSFPA, Gerry Gerbasi, Owner of GJG Associates, Carolyn Bateman, Inspection Manager, Canadian Food Inspection Agency, and Steven Burton, CEO of Burton Software Inc., explain the highlights of the upcoming changes to food safety regulations, regulatory challenges, and how new technologies can help companies with the transition. A warm thank you to our excellent panelists for their thoughtful participation in this webinar. With over a decade of experience working in the value-added food industry, Candice Appleby has extensive experience in food safety programs and financing farming ventures. She works closely with government, industry associations, and individual producers on a wide range of local, provincial and national food issues. Executive Director of the Small Scale Food Processors Association (SSFP) since 2004, she has been working with the organization to be Canada’s leading support organization for small and medium enterprises in the food processing industry by providing leadership, education, marketing, networking and advocacy to foster success in a competitive global market. A farmer’s daughter and federal employee, Carolyn Bateman is the Inspection Manager at the Canadian Food Inspection Agency (CFIA) and shares her familiarity with the regulatory challenges food producers face and how to address them, particularly in light of recent efforts to modernize inspections. Gerry Gerbasi is a true guru of food safety and owner of GJG & Associates (food safety consultants), located in Canada. A former Manager of Quality Assurance and Technical Service responsible for food safety at the Lucerne Foods Division of Safeway, he is one of the most highly respected food safety consultants on the West Coast. Steven Burton, creator of Icicle, is a software architect who started his career in architecture and moved into construction before establishing a successful manufacturing business in the ’90s. Moving into the software sector in the late ’90s, he established Burton Software in 1999 to specialize in the development of high-performance web-based software application. Burton initially designed Icicle to address the challenges to managing food safety for small to medium-sized stakeholders in the food industry. With Icicle, Burton strives to improve the safety of the world’s food supply by developing the tools to empower companies involved in the production, processing and distribution of food products to develop and verify codex-based HACCP systems.